Lignocellulosic biomass feedstocks are available on a scale that other solid or liquid renewable resources cannot match. The United States has enough domestic feedstocks to potentially supply 30–45 billion gallons of fuel, which would lessen the nation’s dependence on petroleum and reduce greenhouse gas emissions. Yet, while biofuels seem an appealing choice over conventional fuels, the low price of crude oil and the challenges with economically producing biofuels on a commercial scale impede the production of biofuels. Lignocellulosic biomass contains 40–60% oxygen which makes technologies for producing hydrocarbon fuels economically challenging. The oxygen functionality makes biomass an attractive feedstock for high-value oxygenated commodity chemicals that are expensive to synthesize from petroleum-derived feedstocks. 1,5-Pentanediol (1,5-PDO), along with two other conventional α,ω-diols (e.g., 1,6-hexanediol (1,6-HDO) and 1,4-butanediol (1,4-BDO)), are plastic precursors primarily used to make polyurethanes and polyesters plastics. These α,ω-diols are currently derived from petroleum and, as a group, represent an annual market over $7 billion with a nearly 7% annual growth rate. A new chemical pathway has recently developed to produce 1,5-PDO from biomass-derived feedstock at six times cheaper cost than a previously reported approach. 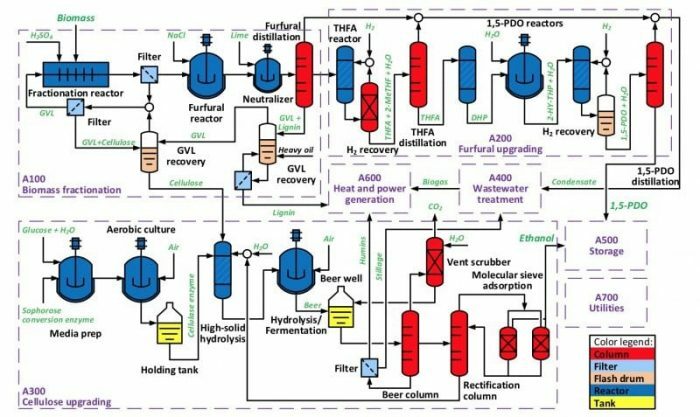 To fully utilize major polymeric components of lignocellulose (cellulose, hemicellulose, and lignin), this technology could be integrated with cellulosic ethanol production to improve cellulosic biorefinery economics. From a process perspective, such integration requires cheap fractionation of lignocellulose into its major components. A recently proposed biomass fractionation approach, using a γ-valerolactone (GVL)/H2O solvent, leads to the production of high purity solid cellulose, and a soluble hemicellulose and lignin stream, which enables further conversion of hemicellulose and cellulose into 1,5-PDO and ethanol, while the remaining lignin could be combusted to produce high-pressure steam for electricity production and process heat. 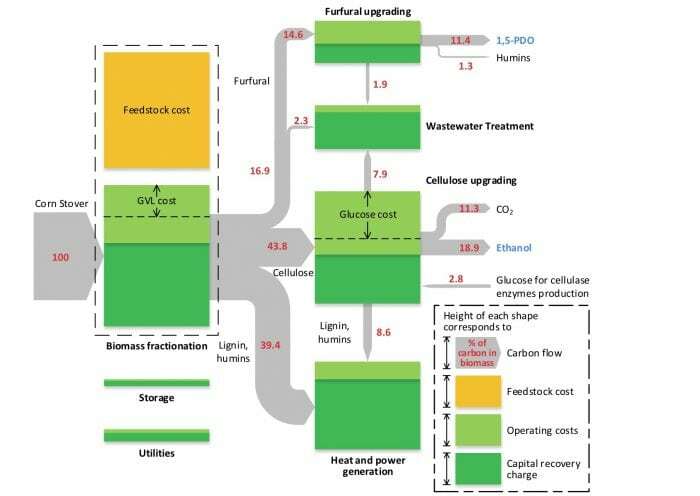 The proposed process uses organosolv fractionation of lignocellulosic biomass, followed by catalytic conversion of the hemicellulose fraction to 1,5-PDO and enzymatic hydrolysis and fermentation of the remaining cellulose to ethanol. The process also includes wastewater treatment, lignin combustion, product storage, and required utilities (see Figure 1). On the basis of experimental data and literature results, Aspen Plus (Aspen Technology Inc., Massachusetts, USA) process models were developed to estimate key material and energy flows for the integrated process. After equipment sizing and cost estimation, a discounted cash flow analysis was used to determine the minimum ethanol selling price (MESP, the price that leads to zero net present value). The selling price of 1,5-PDO for the coproduction strategy that leads to same MESP ($2.16/gal) as the ethanol-only strategy was determined (see Table 1). The coproduction strategy becomes competitive with the ethanol-only strategy when 1,5-PDO can be sold at or above $1140/ton, which is much lower than the market price of 1,5-PDO ($6000/ton), as well as its substitute 1,4-BDO ($1600–3300/ton) and 1,6-HDO ($3000–4600/ton). 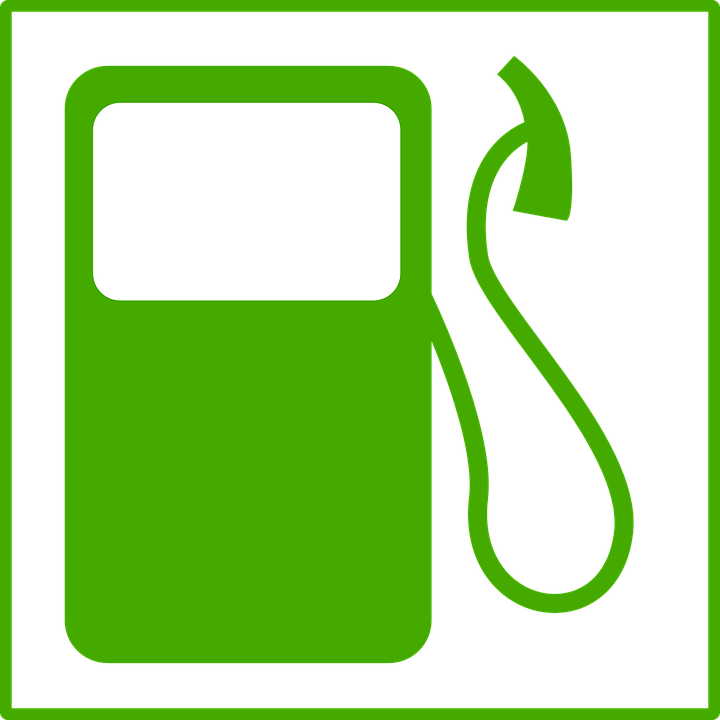 Since the coproduction strategy diverts the C5 sugars, originally available for fuel production, the ethanol production rate is reduced from 60.5 MM gal/yr to 38.1 MM gal/yr. The coproduction strategy gives a conversion of 25% of the initial mass and 30% of the carbon content into products (Figure 2). These yields are slightly higher than the yields obtained by the ethanol-only strategy (228 kg of ethanol per dry metric ton of biomass or 22.8 wt% yield). Figure 2 also shows the contribution to the overall production cost (per gallon of ethanol) by process area. Note that feedstock cost is not the primary cost contributor at $80/dry metric ton. The major contributor is the biomass fractionation area. The proposed strategy can improve the overall economics of an integrated bioethanol production process and significantly lower the price of ethanol by more than $2.00/gallon. In Figure 3, it can be seen that the co-production process leads to a bio-ethanol selling price of $1.35/gallon when 1,5-PDO is sold at $1600/ton, which is the historical lowest price of C4-C6 diols. This bioethanol selling price is lower than the current ethanol price of $1.52/gallon and much lower than the current bioethanol price without co-production of 1,5-PDO ($2.16/gallon). 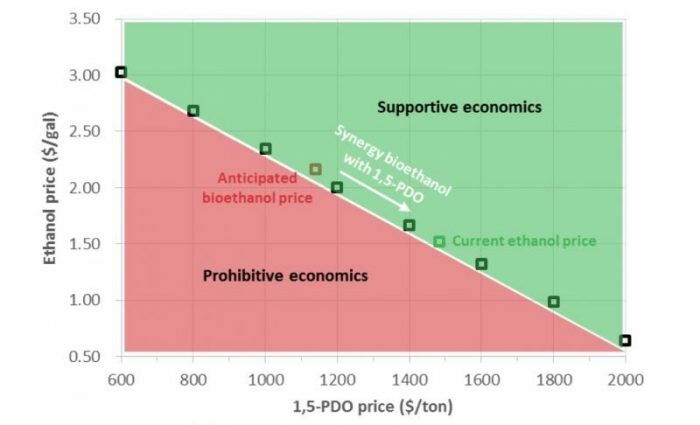 Furthermore, 1,5-PDO’s selling price will likely be much greater than $1600/ton – possibly up to $3000/ton – which would lower the bioethanol price even further. These findings are described in the article entitled Improving economics of lignocellulosic biofuels: An integrated strategy for coproducing 1,5-pentanediol and ethanol, recently published in the journal Applied Energy. This work was led by Kefeng Huang from the University of Wisconsin-Madison. Kefeng Huang currently works at the Department of Chemical and Biological Engineering, University of Wisconsin–Madison. Kefeng does research in Process Systems Engineering for Sustainable Energy Systems.